Hello! I’m Ambra, and I will be an intern at Glasgow Women’s Library for the next six months. 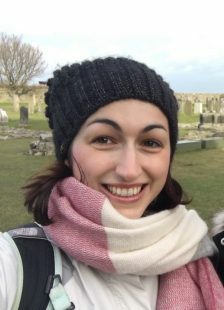 I’m originally from Italy, but have been living in Scotland for a few years now; currently, I’m a student at the University of Edinburgh, where I’ve been working towards my PhD in Classics as well as teaching part-time as a tutor. My degree is partially sponsored by the Scottish Graduate School of Arts and Humanities (SGSAH), and it is through them that I was able to apply for the opportunity to work with the GWL. 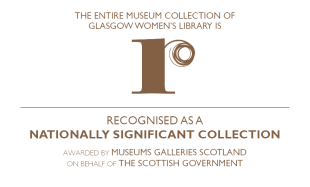 When I first heard about the internship, I did some research into the history and activities of the Glasgow Women’s Library, and was immediately enthusiastic at the idea of collaborating with an institution that so closely mirrors my own values. The internship I applied for is connected to the Vote 100 project: namely, a set of 100 videoclips commemorating suffragettes and suffragists of Scotland and the world, created by the GWL in collaboration with various animators to commemorate the centenary of the suffrage in Scotland. My role in the project will be to help ensure that the Vote100 animations reach as wide an audience as possible; specifically, I will be liaising with schools and other contacts in the education sector, not only making sure that they are aware these resources exist, but also devising a toolkit comprising additional material, information, and learning activities that will help students make the most of the Vote100 project. Being a research student in Classics – that is to say, more specifically, dealing with Ancient History, Ancient Literature, and a smidge of Archaeology – I am extremely aware of how important it is to make knowledge accessible to diverse audiences. Too often history and culture can appear to the general public as something to be guarded by academics in ivory towers, rather than openly made available to all. For this reason, especially in later years, I have been increasingly passionate about public outreach and public engagement. I’m looking forward to further exploring ways of educating outside academia as I work on this project. While it’s still early days in my internship, I’m happy to say it got off to an extremely promising start. Everyone at the GWL has been so kind and welcoming, providing invaluable guidance and useful advice, while still giving me the freedom to design my own approach to the project and make my own path through the internship. After being in academia for most of my life, it will be a refreshing challenge to spend these months in a different working environment, and I am excited about the chance to shed light on such an important chapter of history as women’s fight for suffrage. Every day it becomes more apparent how essential and necessary inclusion, diversity, and equality are to society; it’s humbling to see how much has been accomplished – and how much is still left to achieve. So let’s get to work! This entry was posted in Blog and tagged with Digital Resources, internship, Vote 100, Vote100, Widening Access.